Installed the new focuser. It's kind of odd. It has a small range of motion with the knobs, but the draw tube has another drawtube that I guess one puts in the right vicinity and then uses the knows to complete the focus. Weird. Here is a planet killer as far as optics go. Mount is worthless junk that jitters at the touch and a image will dance around for 8 secs. This was a 1975 Cervit mirror by Cave that was refigured by Galaxy in 1988. Every bit as good as my Zambuto's were. Mars was super last week at 500x. But it will need a pricey mount like a used AP1200 non GO-TO mount or maybe a AP 900 can do ok with it. Nice installation! I am slowly restoring a unique Cave 12.75” and replaced the old focuser with a Moonlight dual speed. 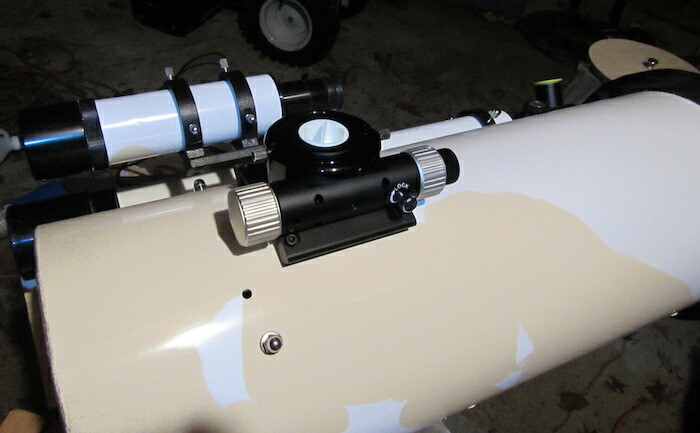 The scope was commissioned by Dr Henry Paul who specified a Skymicro 1.25” focuser. By the time it came to me it had an old 2” focuser that was period correct but a pain to use. Much better now! You have an absolutely beautiful scope! Edited by ltha, 19 January 2019 - 10:20 AM. You have the same finder i do, but newer rings. Edited by ltha, 19 January 2019 - 03:19 PM. Only thing I'm waiting on is the 8" f/8 mirror from Ostahowski. 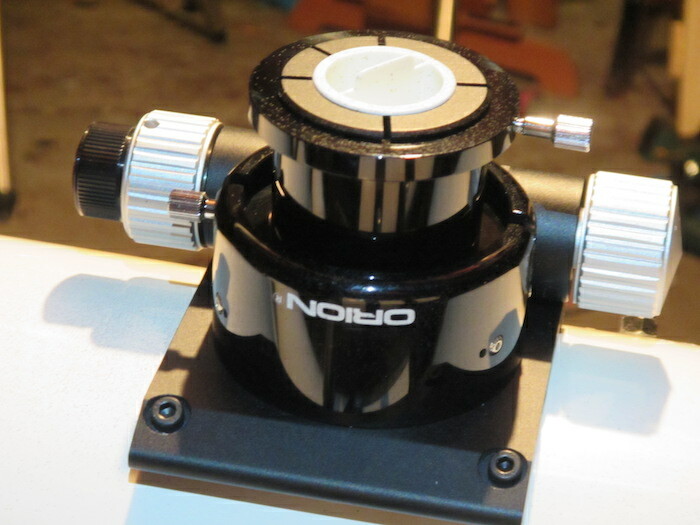 I'm wondering if I should replace the secondary holder (and, therefore, the spider) with an Astrosystems model. The old secondary cracked at that leading edge in the holder. I would know that a new holder would be exactly the right size as my new Antares secondary. Also, the collimation screws on the old holder are slotted and a bit dodgy. For another thing there are only three screws, not the usual 4. The holder is proprietary to that spider, so replacing one means doing both. How does one install a spider since it is wider than the tube? Got the main mirror. That was quick. I will install it this weekend assuming it's not subzero weather. I have the optics. The secondary holder is pretty old and it has three slotted machine screws for collimation. They seem a bit nackered and the guy at the hardware store can't figure out which size they are. I'm also not absolutely sure the secondary will fit properly in the supplied holder. So, for a little more than nominal cost I ordered a new holder and spider (the old spider only fits its holder) from Astro Systems. So, I've got a few weeks to wait for it, then I will install the mirrors. My favorite way to attach the primary to the cell is with three blobs of silicone glue. Unfortunately, the primary has a raised edge on the non-aluminum side that will prevent that attachment method. So, I'll have to use the clips. First, I would not go with a split ring Newt for exactly the reason Jon mentioned. If you wanted that option for tracking, just get a Go2 Dob or a tracking platform. Split ring Newt can put eyepiece in just horrible location. The major issue with either of these is that depending on your location, seeing may limit both of these to working at less than their full capability on both nights, and the 12" will suffer a bit more than the 10". Adding boundary layer fans will up the weight of both, but since the weight of the 12" OTA is already pushing 50 lbs, adding fans is just that much more to handle. The 10" could be kept under 40 lbs with fans and will be easier to boundary layer scrub (and with with boundary layer fans, cool down is going to be far less of an issue because boundary layer scrubbing means you don't need to cool the mirror. I think there would be fewer occasions where the 12" would outperform the 10" if you live somewhere with poor seeing, but if you live somewhere with lots of excellent seeing, 12" will just be a better all around scope and unless the only use for the instrument is planetary, then the 12" to me seems to be the way to go. While the OTA will be 50 lbs, this is still manageable by many people, and if it is not manageable by you, then I would think that we would not be having this conversation. A highly optimized 10" though would probably keep up, but only at the cost of loosing some of the all around capability of the 12". Again, if only use is planetary, a highly optimized 10" would be hard to beat on a night of typical seeing for many. But only hard. Not impossible. What secondary sizes, for general use, would be good for 12 F5 and 10 F6? I need to figure out how to attach a fan without introducing vibrations. It runs on 8 AA batteries. Edited by Riccardo_italy, 19 February 2019 - 04:43 PM. It depends on the distance from your secondary to your focal plane. That is usually your focuser height half racked out plus the radius of the OTA, or if truss, UTA. I have a 10 inch f/6.3 with a 1.8 inch diagonal, and a 12.5 inch f/5.9 with a 2.1 inch. Use the calculator Don H provided and you will learn a lot about how field illumination works. If you are trying to make a planetary observing instrument the answer is different than for a widefield sweeping scope. Kudos for your choice of Astrosystems UTA gear. It's very good. Well, I've got the stuff. The question is really how to attach it. My 8" Dob has a ventilated sonotube. I put the fan on a 1/4" thick plywood disk that covers the back end of the tube, so air must go around the mirror. It works well, but it introduces a bit of vibration. So this new scope tube is fiberglass and is wider than the mirror. Edited by Deep13, 22 February 2019 - 12:54 PM. I recommend the Scythe case fan line. It is best to go "large and slow", a larger diameter, slower fan. When I got my first Scythe 120mm case fan (30 CFM), and I tested it by connecting it to a 12V power source and thought at first "Dang, it doesn't work", then I looked at it and saw it was running - I was holding it in my hand in a reasonably quiet room and did not know it was spinning. They also run forever - 120,000 hr MTBF (15 years of continuous operation). Edited by careysub, 23 February 2019 - 11:47 AM. There are a second set of holes to move the mirror foreward. I'll probably attach the fan with small, elastic straps. There are 4 mounting holes on the fan and only 3 extra holes on the scope, so I'll need to be creative. An F/6 or longer focal ratio mirror of 8 or 10-inches aperture can be made to a very high standard of optical quality, and that matters a lot more than the focal ratio. I have seen incredible views of the planets during steady seeing through Dobs with focal ratios as low as F/4, but most telescopes where I got those memorable views were of F/6 or longer focal ratios. 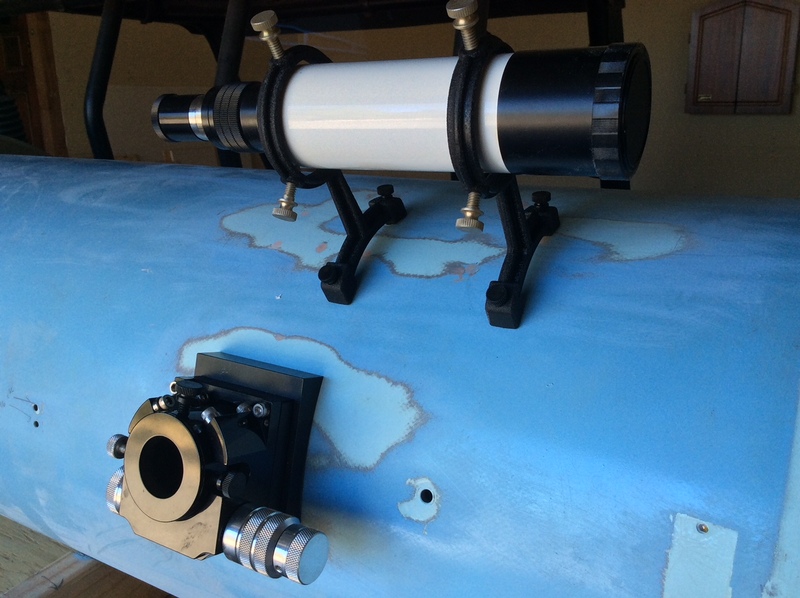 As long as you have high quality optics that are properly mounted, correctly collimated, and you have good seeing, hours of enjoyable observing of the planets await you. Edited by Achernar, 26 February 2019 - 05:19 AM. Got the A.S. spider and secondary holder, so now I just need to put it all together. Thinking I'll put the fan on a 1/4" plywood disk, then use those tiny elastics with the braided sleeves to connect it to the tube. Not sure about the placement of the 8-AA battery holder. On the tube or on the mount? I might have to wait a little will to finish it. In a history PhD program and I'm impossibly busy. I can vouch for the ideal viewing conditions in San Diego. I lived there for over 20 years. The only "drawback" was that it made me lazy at times. There were many nights when, tired form a full day's work, I would sometimes cancel a night of observing in the comfort of knowing that I wouldn't have to wait for another month before skies would clear. I now reside in Pittsburgh, Pa. A whole different climate. When I get the rare clear night here, I best well better grab it while I can. As for the ideal planetary scope, the 3 best ones I owned were a Discovery F/9 dob, the Orion 7" Mak-Cass, and the 6" F8 Dob. I no longer have the Discovery Dob or the 7 " Mak but I will never part with my 6" f/8 dob. It's very portable, with a quick cool-down time, it's easy to collimate and it provides sharp lunar/planetary views. I simply plunk it down in my back yard and it's ready to go.